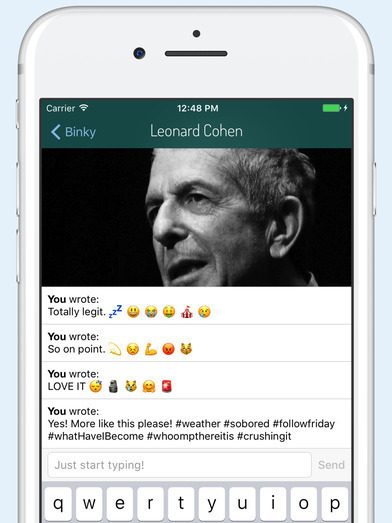 Meet Binky, The Social Media App Where Nothing Matters : All Tech Considered A new social media app lets you think that you're liking, commenting and sharing an infinite list of random posts. But "it's all meaningless," Binky creator Dan Kurtz says. And that's the point. Do you ever feel like social media apps are a waste of time? A new app called Binky sets out to prove that point. Open Binky and you'll find an infinite list of random stuff: Llamas. Hot sauce. Joan of Arc. Much like Twitter, Binky displays posts on a timeline. Unlike Twitter, nothing you do matters. See an image you like? Swipe right! See an image that makes you sad? Swipe left! Do you relate to that photo of Amelia Earhart on a deep spiritual level and feel that you must, must share it? Re-bink that! Do it! Binky is a new social media app where users can scroll, share and like random posts, but all the actions are meaningless. The options are endless — and utterly meaningless. Interacting with a Binky post does nothing. It is a false action. There is no record of it. Your friends will never know that you commented "wha-aaa-aaa-aaat that is so cool #bffs #badidea #drunkhungryandsad" on a picture of René Descartes, the French philosopher. Actually, you can't even comment. When you attempt to do that, a keyboard appears, but, much like the app itself, it's meaningless. With each keyboard click, a pregenerated word appears. As soon as you click away, the comment disappears forever. If you're wondering, "what's the point?" that's kind of the point. "Binky is just as meaningless as other social media apps, but it's upfront about it," Binky creator Dan Kurtz tells NPR's Morning Edition. Kurtz says his inspiration for Binky came after he scrolled through his social media feeds, only to realize he couldn't remember what he just read. "Does that mean that like, nothing I'm seeing on Facebook actually matters? If I replaced all the stuff that I'm seeing with just random photos of chairs and condiments, would that be just as compelling?" he says. "It turns out the answer is yes." Binky has all of the cute cat photos of social media, without the sometimes stressful consequences of it. "[It's] the freedom to satisfy the appetite that you have for scrolling through stuff, without needing to worry about any of the consequences, because it's all meaningless," Kurtz says. So is this ruse pointless? Maybe this is a commentary on what drives us to pick up our phones every 20 seconds, Haje Jan Kamps writes for TechCrunch. Kamps argues that Binky could be "a no-cost ... habit-reinforcing fidget spinner for the social-media addicts among us." Binky is a social networking app without socializing, and yet, Binky may be "even more" satisfying than real social media apps like Twitter or Instagram, writes Ian Bogost, a contributing editor at The Atlantic. Binky will never let you know that your favorite show is being cancelled. He says Binky may even cure the ills of smartphone compulsion: a way to use smartphones without doing anything at all. "Isn't that all anyone really wants?" Bogost asks. Or maybe it's yet another reminder of how entrenched we are in this digital world and, try as we might, we can't escape. Laura Roman is the social media strategist for Morning Edition; Taylor Haney is a production assistant for Morning Edition.